Get behind the wheel of one wild ride when the Vestron Video Collector’s Series releases Stephen King’s Maximum Overdrive on limited-edition Blu-ray on October 23 from Lionsgate. Written for the screen and directed by the original Master of Horror – Stephen King – this marks the first time ever that this horrifying film about sentient, homicidal machines has been released on Blu-ray in the U.S. Maximum Overdrive is loaded with all-new special features, including interviews with Producer Martha De Laurentiis and Special Make-Up Effects Creator Dean Gates; on-set vintage interviews with Stephen King, Emilio Estevez, and Laura Harrington; behind-the-scenes footage; and more! 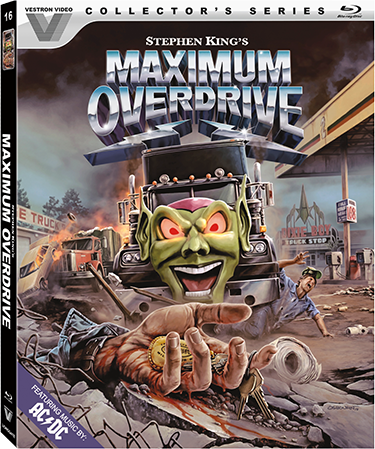 The Maximum Overdrive limited-edition Blu-ray will be available October 23rd!